Disclaimer: The information on this page is intended for individuals who have been medically diagnosed with wrist bursitis. If you suspect that you have bursitis in the wrist then it is important to visit a qualified medical professional in order to rule out any other possible causes prior to considering any advice or treatment option. 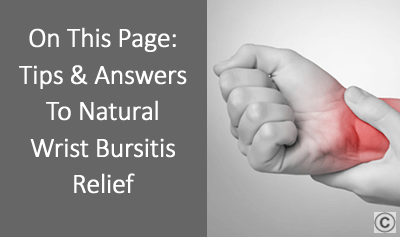 Are you suffering from inflammation, swelling or other painful symptoms of Bursitis in the Wrist? Is Wrist Bursitis pain affecting your work, sleep or lifestyle? The smooth movement of tendons across bones and other tissue in the hand is aided by small lubricated balloon like structures in the hand called a bursa (also spelt Bursae). There are many of these bursa throughout the body but two in particular protect the tendons in the hands. These are called the radial bursa and the ulnar bursa. What are causes of wrist bursitis? As mentioned the wrist is an extremely overused joint in the body and the constant stresses that the wrist undergoes on a daily basis is rarely appreciated until wrist pain occurs. Sudden impact such as from a fall, sporting injury or blow. Natural wear and tear of the joints. What are the symptoms of wrist bursitis? Moderate to severe wrist pain when lifting heavy objects. What are some options for wrist bursitis treatment? As with most types of bursitis, wrist bursitis may be simply treated with ice, immobilisation and rest within the first 24-48 hrs following the initial onset of wrist pain or inflammation. If caught early and treated this way, then wrist bursitis has a better chance of resolving without further intervention then most other types of bursitis. Unfortunately many individuals miss this initial window and their wrist bursitis continues to cause swelling and pain in the wrist. Having tried already one or more of these with little to no benefit. Not being suitable for these types of wrist bursitis treatments due to age and health. Having a contra-indicative pre-existing medical condition. In addition such procedures are known to be painful and therefore seen as invasive by some individuals currently suffering from wrist pain caused by bursitis. Then again some people may just prefer to investigate what natural wrist bursitis treatment options are available. 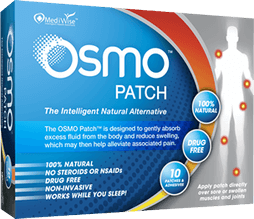 Fortunately, the OSMO Patch combined with proper rest now offers an Intelligent 100% Natural Alternative! The OSMO Patch is especially designed to draw fluid from the body and reduce swelling and associated pain in conditions such as wrist bursitis. The OSMO Patch is ideal for supporting the reduction of swelling and pain associated with bursitis and inflammation in the wrist. Simply stick the OSMO Patch over the lump or area of pain on the wrist just before going to sleep. The patch can then go to work removing fluid and stimulating blood flow continually throughout the night while you sleep. Then when you wake up in the morning the used patch is removed from the wrist and simply discarded. So if you are ready for a natural & effective approach to supporting the relief of inflammation & pain due to bursitis in the wrist then the OSMO Patch is the Answer!